A leading South Korean businessman whose suicide led to the resignation of the country’s prime minister had links to Russia, it has been revealed. The suicide sparked a series of scandals in the highest echelons of the Korean government and business elite that has the potential to become the most serious trial for the country's political system in the last decade. It has come to light that a corruption scandal raging in South Korea that has forced Prime Minister Lee Wan-koo to resign in the wake of the suicide of a prominent businessman has a Russian connection. South Korean Prime Minister Lee Wan-koo offered his resignation to President Park Geun-hye by telephone on April 21. Park Geun-hye, is currently on a state visit in Latin America and is expected to return to Seoul only on April 27. The Renhap Agency cites a representative of the South Korean government as saying that Lee Wan-koo had decided to divest himself of authority "after long reflections." The representative did not say what exactly motivated the prime minister to do so. The key to the enigma of Lee Wan-koo's resignation can be found in the recent mysterious suicide of renowned South Korean businessman Sung Wan-jong, who had been accused of corruption. Wan-jong had headed the Keangnam Enterprises Corporation, which, according to South Korea's Prosecutor General, used state funds to realize large energy projects abroad. Moreover, one of the investigation episodes is related to Russia, where for a few years Keangnam Enterprises had worked with the Korea National Oil Corporation (KNOC). In 2003 Keangnam, in collaboration with KNOC and five other South Korean companies, decided to participate in the exploration of oil and gas on the Western Kamchatka shelf in Russia’s Far East. The Russian partner was oil company Rosneft, which owned 60 percent in the West Kamchatka Holding BV project company, while the South Korean consortium had 40 percent. The South Korean companies were responsible for paying for the geological exploration. In the following five years only one explorative oil well was drilled on the plot out of the three planned, but substantial oil and gas reserves were not found. Korean expenses had already mounted to around $300 million by this stage. In 2008 the Russian Ministry of Natural Resources and Environment revoked Rosneft's exploration license for this territory and in 2009 gave it to Russian gas giant Gazprom. For a year the South Korean companies held talks with Gazprom about the continuation of the project before finally abandoning it in 2010. In March the South Korean prosecutor's office searched the offices of Keangnam and KNOC while carrying out investigations concerning corruption, abuse of power and misuse of funds. 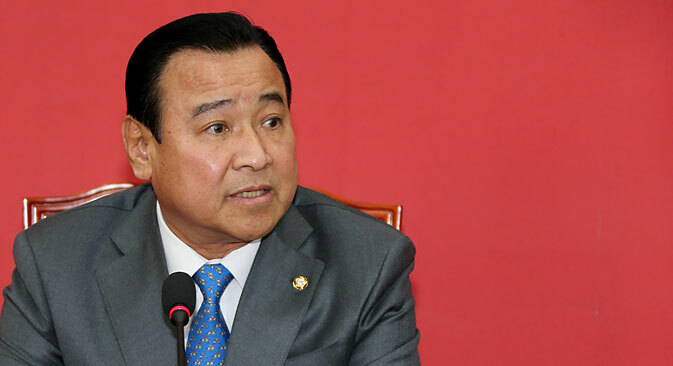 On April 8 Sung Wan-jong denied accusations that he had exaggerated about the expected returns from the Kamchatka project, thus bringing damage to the government. On April 9 he was found hanging from a tree by his tie. In his suicide note Sung Wan-jong named eight high-ranking South Korean politicians to whom he had given bribes in recent years. By each surname he listed the exact amount. Besides Prime Minister Lee Wan-koo, "Sung's list" includes directors of the former and current presidential administrations, as well as regional governors. The situation is made especially awkward by the fact that Lee Wan-koo became head of the South Korean cabinet only two months ago. Ironically, literally days before his resignation, Prime Minister Wan-koo had said that one of his priorities was waging a "total war" on political corruption. The raging corruption scandal in South Korea threatens to deal a serious blow to the reputation of Park Geun-hye, the first female president to be elected in the country. According to former Russian Ambassador to South Korea Georgy Kunadze, the prime minister's act could serve as an example to many officials. "He announced his resignation in order not to have the authority of his position doubted and not to have his position as prime minister put pressure on the investigation," said Kunadze. Is decision to supply Tehran with S-300 missiles a signal from Moscow?